Increase in demand for automotive owing to rise in disposable income of consumers primarily drive the growth of the market. In addition, the adoption of power steering system in vehicles is responsible for the growth of this market. The effective steering system is accountable for increase in fuel efficiency of the vehicle. Hence, the increase in demand for fuel efficient vehicle results in increase in demand for steering system. Also, the consumers prefer driving comfort in their vehicles, which includes the effortless driving and maneuverability of the vehicle. The driving comfort is achieved by using effective steering system resulting in increase in demand for steering system implementing growth of this market. However, the high cost associated with power steering system is anticipated to hamper the growth of the steering system market. The technology such as drive-by-wire is expected to be implemented in the upcoming vehicles, thus boosting the growth of the market in near future. The key players operating in the automotive steering system market include China Automotive Systems Inc., JTEKT Corporation, Nexteer Automotive, Mando Corporation, ThyssenKrupp Presta AG, Robert Bosch Automotive Steering GmbH, Showa Corporation, NSK Ltd, Mitsubishi Electric Corporation, Sona Koyo Steering Systems Ltd., and Hyundai Mobis Co. Ltd. The global automotive market is observed for continuous growth as the market experiences continuous demand for vehicles. The developing countries such as India, China, and Brazil among others are the most demanding countries for automotive sector. China, being the world’s largest market for vehicles, is expected to grow further over few years as most OEMs are also making large investments in this sector. 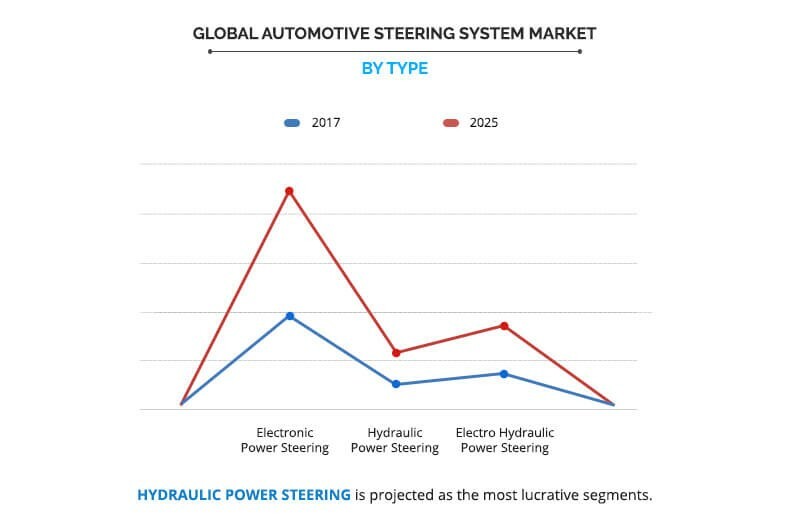 The increase in demand for vehicles in automotive sector explicitly results in rise in demand for steering system as every automobile needs steering system to control vehicle direction. Also, the vehicle accident may lead to change in steering system or its component which leads to increase in demand for steering system in the aftermarket. Hence, the increase in demand for vehicle is anticipated to increase the demand for steering system in near future. The automotive industry has developed from manual steering systems, which use only mechanical linkages such as rack and pinion, to power steering system. The manual steering system has limitations regarding maneuverability and fuel efficiency of vehicle. However, the power steering system has hydraulics and electronic components, which assist the driving and simultaneously improve the efficiency of the vehicle. Hence, the power steering system has been widely accepted all across the globe. The increase in adoption of power-assisted steering is responsible for increase in demand for steering system in the automotive industry. Power steering system is widely used in different types of vehicles such as passenger cars, light commercial vehicles, and heavy commercial vehicles. The power steering system has either electronic motor or hydraulic piston depending upon the system used in the vehicle as compared to manual steering system. These parts are costlier, which increases the price of the steering system. High cost of power steering system is responsible for the hike in the car prices. Hence, high cost associated with power steering system is expected to inhibit the growth of the power steering system market. The consumers demand maximum features in their vehicle from manufacturer including power steering system that makes vehicle more responsive resulting in increase in driving comfort and drive quality. The developing countries such as China and India have uneven road conditions, which need better steering mechanism to improve the drive quality. Along with this, developed countries such as the U.S., the UK, and Germany have freeways where vehicles need adaptive steering system to control the vehicles running at high speeds. These factors also make the drive comfortable for consumers. Hence, the automotive steering system market is expected to grow as the consumers prefer to choose driving comfort. 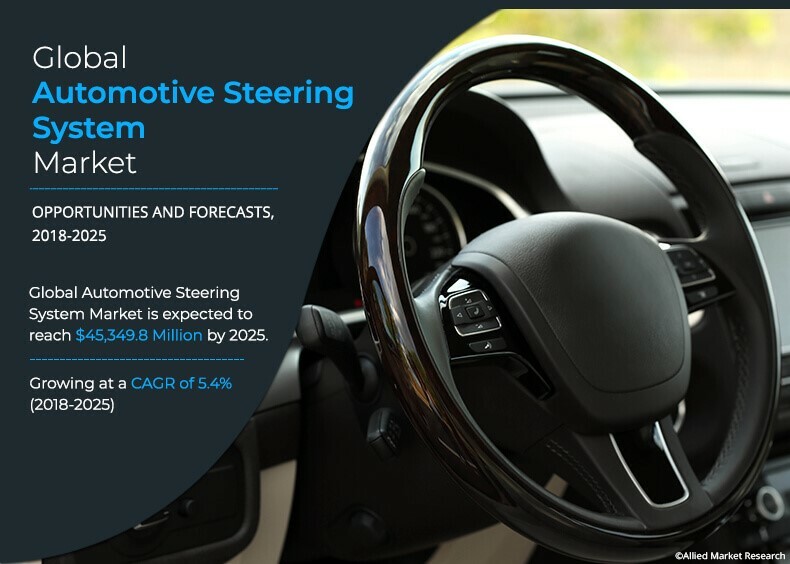 This study presents the analytical depiction of the automotive steering system market analysis along with the current trends and future estimations to depict the imminent investment pockets. An automotive steering system is a set of components used to control the direction of vehicle motion and help the driver maneuver the vehicle as per the requirement. The hand-operated steering wheel, steering column, universal joints, and rack & pinion mechanism contribute to the automotive steering system component. 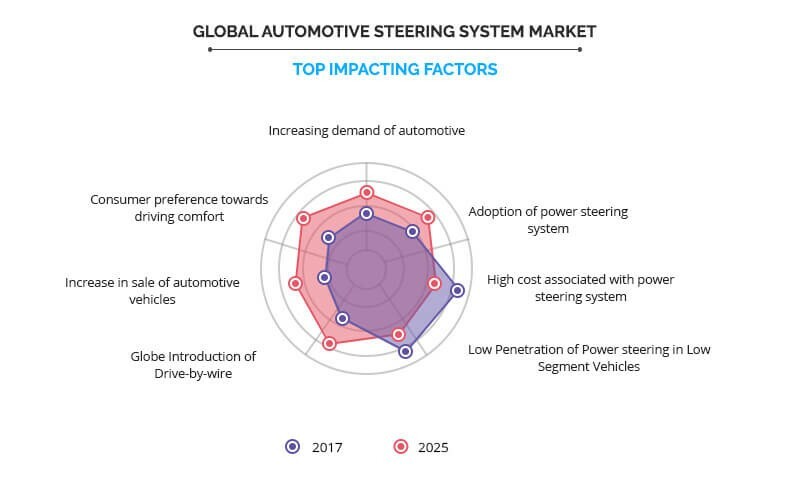 The automotive steering system market is in its maturity stage and is contributing significant revenue for the overall automotive industry. Increase in demand for automotive owing to rise in disposable income of consumers drives the growth of the market. Along with this, the adoption of power steering system in vehicles is responsible for the growth of this market. The effective steering system is accountable for increase in fuel efficiency of the vehicle. Hence, the increase in demand for fuel efficient vehicle results in rise in requirement of steering system. Also, the consumers prefer driving comfort in their vehicles which includes the effortless driving and maneuverability of the vehicle. The driving comfort is achieved by using effective steering system resulting in increase in demand for steering system implementing the growth of this market. However, the high cost associated with power steering system is anticipated to hamper the growth of the steering system market. Among the analyzed geographical regions, currently, Asia Pacific is the highest revenue contributor and is expected to dominate during the forecast period, followed by Europe, North America, and LAMEA. This growth is attributed to the increase in demand for automotive sector for various types of vehicles ranging from low-end passenger cars to high-end commercial vehicles.